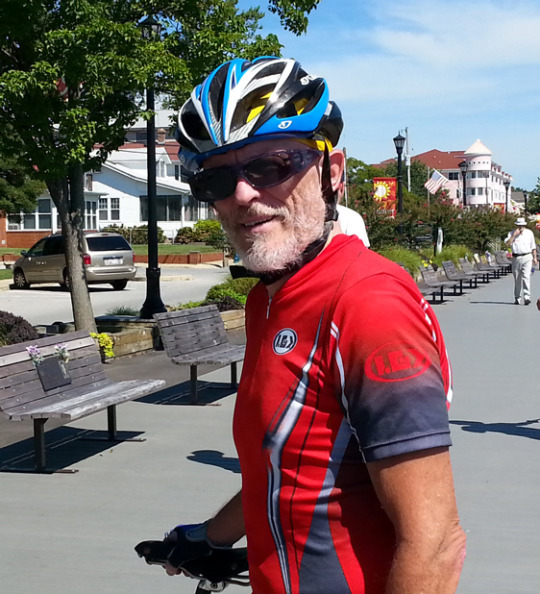 This is the second of a series of posts on gearing for road bikes. 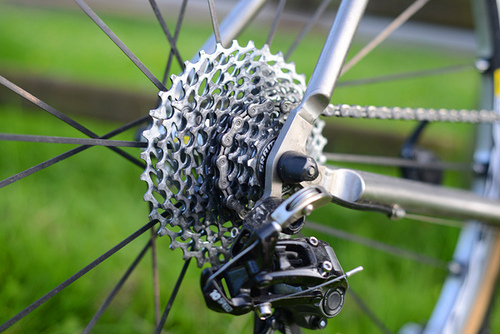 It’s aimed at riders who are seeking a basic understanding of bicycle gearing. Chainrings for road bikes come in many different sizes and configurations. 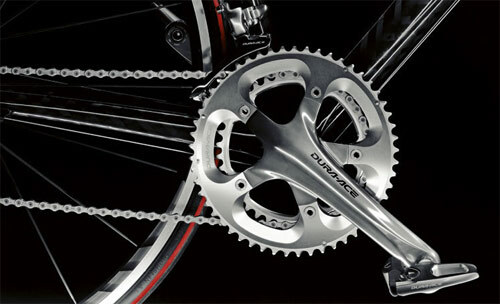 Standard two-chainring setups (commonly called doubles) usually feature combinations of either 53 and 39 tooth rings, or 52 and 39 tooth rings. Compact doubles usually have 50 and 34 tooth rings. Triples (3 chainring setups) usually have either 53-39-30 tooth combos or 52-42-32 tooth combos. In addition to these standard sizes, it is possible to combine different size rings into unique combinations. Cassettes for road bikes also come in a variety of configurations. 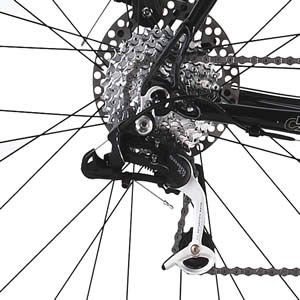 For example, Shimano, one of the premier manufacturers of bike gear, lists 6 basic sprocket configurations for their 10-speed cassettes. As is the case with rings, it is possible to combine sprockets into unique cassette combinations. I’ll use a basic setup of a 53-39 standard double and a 12-25 cassette to illustrate some basic yet important things about gearing. All of the main points made here will hold no matter how your bike is geared. Here are the gears available with a drive train composed of a 53-39 double and a 12-25 cassette in both gear inches and meters of development. The numbers were calculated using Sheldon Brown’s outstanding online gear calculator which has been used by cyclists for many years . As noted in Gearing Part 1: The Basics, meters of development is a system that is used more commonly in Europe than in the US. Because it tells you how many meters the bike moves forward every time the pedals go around once it makes it easier to understand how different gear combinations translate into the work you’re doing on the bike. There are several important things that can be shown by examining the numbers in these tables. First, it seems that many people have the mistaken idea that all of the gears on the small (39 tooth) ring are smaller or easier than all of the gears on the big (53 tooth) ring. Looking at the numbers in the Meters of Development table shows that this isn’t the case and that there is a large amount of overlap in the gears available on the two rings. 53-25 is the easiest gear on the big ring; it moves you forward 4.6 meters every time the pedals go around once. This gear is bracketed by the 39-19 gear (4.4 meters) and the 39-17 gear (4.9 meters) on the small ring. Comparing the numbers in the table for the two rings you can see that the gears from 53-16 to 53-25 overlap with the gears from 39-12 to 39-17. In other words about 60% of the gears available on one ring are, more or less, also available on the other ring. Does this mean that you’re getting ripped off because so many gears are more or less duplicated on the two rings? Not at all. While the big ring gives you a bigger top end and the little ring gives you a smaller bottom end, the main function rings are designed to provide has to do with the size of the steps between one gear and the next when you shift. Take a look at the amount of change involved between shifting on the big ring into the 53-12 gear from the 53-13 gear. That shift moves you forward .7 more meters every pedal revolution. Now look at the same shift on the small ring; shifting from the 39-13 to the 39-12 gear moves you forward .5 more meters with every pedal revolution. It’s the same 1-tooth change on the cassette but it has a bigger effect on the big ring than the small ring. This is true for almost every shift from one gear to the next on the cassette. The shift on the small ring is smaller and more refined than the same shift on the big ring. An exception in the table is the shift from the 17 tooth sprocket to the 16 tooth sprocket. This shift is listed as an increase of .4 meters for both rings. However, this is a rounding artifact; if we carried the math out to more decimal places it would show that the change on the small ring is smaller than the change on the big ring. What’s going on here is that gear relationships are nonlinear. A one-tooth change does not always equal the same amount of effort that has to be expended to increase (or decrease) your speed. In general, the bigger the gear you’re in, the bigger the change involved in moving up or down 1 tooth on the rear sprocket. We saw this when looking at the difference in the 1 tooth change from the 13 tooth to the 12 tooth sprocket on the big and small rings. The same thing is true when you look at what happens when shifting between gears on the rear sprocket while you stay in the same ring. Take a look at the change involved in shifting from the 53-25 gear which is the easiest gear on the big ring to the next harder gear on the same ring, the 53-23 gear. That’s a change of two teeth (from 25 to 23) and you have to put out the effort to go .4 meters further with every pedal revolution. Now look at the change from the 53-13 gear on the big ring to the hardest gear, the 53-12. That’s a change of only 1 tooth but you have to put out the effort to go .7 meters further for every pedal revolution. Half as many gear teeth and 75% more effort. All of this can seem overwhelming at first. What? In order to make effective use of your gears you’re supposed to do some math in your head while you ride? You could do this, but I don’t think it’s a good way to make use of this information. I think the best way to get comfortable with how to use your gears to best advantage is to ride your bike with two basic ideas in mind. First, there’s a lot of overlap between rings so you have several ways to solve the gearing problems you encounter. 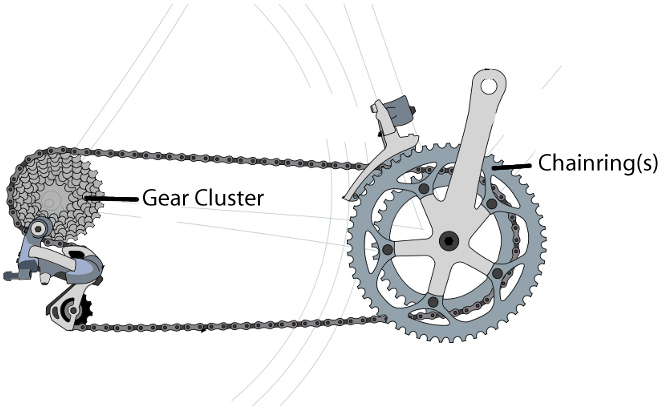 Second, gearing relationships are nonlinear so that a shift from one gear to the next on the cassette will have a bigger effect if you’re on the big ring than the small ring. Keep these two things in mind, stay aware of which gear you’re in, and ride your bike. It won’t take long until you develop an intuitive understanding of how the smaller, more refined changes that you get when you’re in the small ring compare with the larger and less refined changes you get when you’re in the big ring. 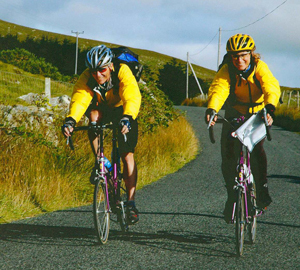 Try different approaches on ascents, descents and flats. When you’re in the overlapping part of the gear ratios, are you more comfortable with the small changes on the small ring or the larger changes on the big ring? With this basic understanding of how your gears are related, you can begin to develop a more sophisticated and efficient use of your gears on the road.